In the language of flowers, Gazania means "I am proud of you." Here, in this lovely escape-the-room game from the creatively stylish Robamimi, flowers and a feeling of pride go hand-in-hand if you can successfully decipher clues and use found objects to unlock the exit door. Gazania is played like most typical escape games—you're trapped in a room and must point and click your way along the four walls, picking up items to turn into useful tools and solving the puzzles you encounter in order to gather even more tools and valuable clues that will lead to the final door code. It also contains a number of typical puzzles, which would be almost too ho hum if not for Robamimi's photo-realistic design, worthy of its own spread in House Beautiful. When ordinary puzzles are planted in a gorgeous environment like this, they're virtually elevated to yumminess. Still, there's one puzzle here you're likely to have never encountered before. It can be figured out with logic alone but the thoughtfully affable Robamimi includes, along with the usual hint button, a "?" option within the puzzle to help you work it out. Altogether, the challenges offered in Gazania are at the optimal middle ground: difficult enough that you can feel proud of your success while plenty of clues and other assistance ensure that that success is well within reach. Thanks to Sam and Cyberjar88 for sending this one in! As you begin, you're facing a table where some wind-up chicks are lined-up in front of a closed window shade. Go ahead and zoom in for a better look. There are six chicks, facing in various directions. Take note of what you see. You can pull the string on the right side of the window shade to open it, but it won't stay open. Now turn left to the door view. There's a shelf over a sink to the left of the door. Zoom in on each for a closer examination of this view. The door needs a 3-digit code to be unlocked. On the shelf, there's a box that has five switches on its front. The spiget on the sink's faucet can be turned left and right, but it appears a certain sequence is needed before water will come out. Turning left again, you see the letters L-I-G-H-T mounted on the wall above two boxes. Get a close-up look of everything in this view, too. The box on the left has four buttons and a chick icon on it. You could solve the puzzle now, but let's come back to it after looking around some more. The box on the right is screwed shut. Looking under the letters on the wall, you can see see a panel of four buttons. Clicking on them will change their colors. If you look closely at the letters themselves, you should find something interesting about one of them, also. Going by the glint of something shiny, there's an object at the bottom of the urn that you can't reach. The picture is in a wobbly picture frame. Clicking on the corners of the picture in the correct sequence should yield useful results. On the chest of drawers there is a book. Thumb through it for a large assortment of clues. Each of the three drawers are locked, too—one needs a 4-digit code, one needs a key, and another...has a tiny hole in it. Now that you've looked around, you're ready to solve some puzzles! After studying the chicks under the window, go to the box on the left under the "LIGHT" wall. Click each of the four buttons in the correct sequence to open the box. Get the PLANTER from out of the box. Look at the "T" in LIGHT and you'll find a lightswitch. Turn it on. Now stand back and look at the lights on the letters. Return to the box on the shelf by the door and examine it. You need to flip the switches either up or down in the correct pattern to open the box. Get the SCREWDRIVER out of the box. After solving the hexagonal box on the shelf, go back to the LIGHT wall and examine the box on the right. You'll end up with a big SCREW. Then look inside the box and get the COMPOST (bag of soil). Turn to the table with the chicks. Put the PLANTER on the table with the chicks, in front of thewindow. Now pour the COMPOST (bag of soil) into the planter. Take the KEY out of the dirt. Inside is a strange new puzzle. After you open the middle drawer, you're confronted with an unusual new puzzle. Four trays of coins, one in each corner, surround a picture. 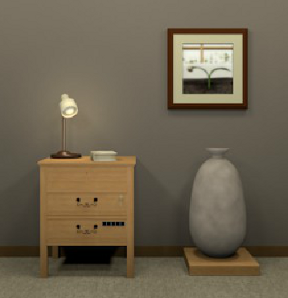 The picture of the sprout is identical to the one on the wall with the wobbly picture frame. So it seems you need to solve this puzzle to get a clue to that one. It's possible to solve it with just this information alone, but if you're stuck, clicking the "?" button in the upper left corner will change the format of the puzzle. 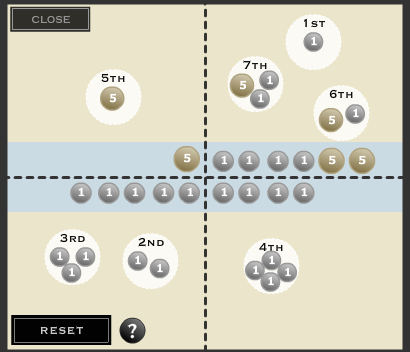 In both cases, the goal is to find work out the sequence of corners to click. Add up the coins so that you have a consequent count starting with 1 and going to...the highest number you can get without breaking the sequence. Because you need to start with 1, and there is a 5 in the top left corner, you know that the top left corner isn't the first one you click. In fact, it can only be the fifth. The bottom right corner can be the 1st and 3rd, or the 4th; it can't be the 2nd, because then you'd have two 2s...and that not only spoils the consequent count, but it's physically impossible to have two 2nds in the corner click sequence. Click the corners of the wobbly picture frame in the correct sequence. TR=top right; BL=bottom left; etc. There isn't a knob but there is a tiny hole in the top drawer and you happen to have a big SCREW in your possession (after using the screwdriver on the other box). Use the SCREW on the top drawer to create a makeshift knob. Open the top drawer and get: a SCRAP OF PAPER. Put together the information you see on page 8 along with the information on the scrap of paper to come up with an important clue. Enter the correct 4-digit code to unlock the drawer. Get a packet of SEEDS: "The Seeds of Gazania"
After getting the packet of seeds from the bottom drawer, go over to the planter on the table and pour the seeds in the dirt. Unfortunately, with the shade closed, the seeds don't want to sprout. Worse, the shade won't stay open by itself. Go back over to the top drawer. Use your SCREWDRIVER to remove the SCREW from the drawer. Then, examine the window shade. Using the SCREW to secure it, pull the string to open the shade. Now that there's sun, the seeds sprout up quickly. Take note of any distinquishing details about the sprouts. The clue book on the chest of drawers will give you another hint about what to look for. Turn the spiget either left or right in the correct sequence to turn on the water. Fill up the WATERING CAN (from behind the wobbly picture) with water. After filling your watering can with water, go back to the planter full of sprouted seeds and pour WATER on them. Turn around and fill up the WATERING CAN with more water. The object you couldn't reach earlier floats to the surface: a ball with a SILVER KEY inside. Take the KEY. When you turn back around, you'll see the flowers have bloomed. Take note of their colors. Click to change the color of each button until you have the proper color code. When the colors are correct, the panel opens to reveal a key switch and a projector. After opening the 4 colors panel, put the KEY in the keyswitch and turn it to "ON." This makes the projector turn on. Turn around to where the projector's light is supposed to be shining... you don't see anything? Use the SCREWDRIVER to remove the screw and close the shade again. Turn the projector back on. Now make note of the problem that's projected on the screen. Walk around the room and do the necessary computations. Go over to the door and enter the 3-digit code. With the correct code entered, the door unlocks. Open the door and escape! Oh thank goodness, I was going mad from boredom. JiG saves again! I like the coin puzzling, but it seemed rather clunky with regards to the narrative. Overall nice diversion. Strong urge to play Neutral's Lights. Constructive criticism: I think escapes are better when they avoid things couldn't really happen. Like where you water the bud that opens up revealing a key. It defeats the verisimilitude. Finished without any walthrough, and barely used the in-game hints? Either I'm finally get good at these games or this one was just so perfectly logical that I didn't need the help. What a nice (and beautiful) little game. Escape puzzles for me are either "zoom through" (like Neutral's mini-games) or "need walkthough constantly." It was lovely to get just a little in-game nudge when needed, and very satisfying to finish without having clues spelled out. It's so nice to see an escape game here! Weekday Escape is the reason I started coming to this site however long ago that was, but it's been MIA for awhile now. And it's a delightful little Robamimi game, too. I would've solved it without any aid if I hadn't miscounted those darn coins. Sometimes I am my own worst enemy. Very nice. Simple but not too easy. Robamimi are my favourite escapers. Nice! This was beyond simple for the most part -- how to use the chicks, for instance, wasn't a puzzle, it was something we were carefully spoonfed. Not what I'm here for. But then that bedside drawer! completely out of line with the rest of the experience. I found this a very unsatisfying game. I really like Robamimi's in-game hints, because - unlike a walkthrough or a forum - they're context-sensitive. I often find myself wishing that other games had similar hints.
. Aside from that, the rest was pretty straight-forward and logical. As someone who has actually done that in real life, I can honestly say that it isn't at all far-fetched. 'gazania' Robamimi, another little gem. screw on the shade before I opened the top drawer. I can't get it back. Looks like I'm restarting? I am playing all Robamimis again (since good games are not quite so common).. the more I play Robamimi's games, the more I like them... some of them I find rather easy like this one, other I found more difficult, but all are just excellent !